Sainsbury's, a UK grocery store chain, made their interest in ebooks clear in June of last year when they bought a controlling interest in the social ebookstore Anobii, and today they started making their presence felt. 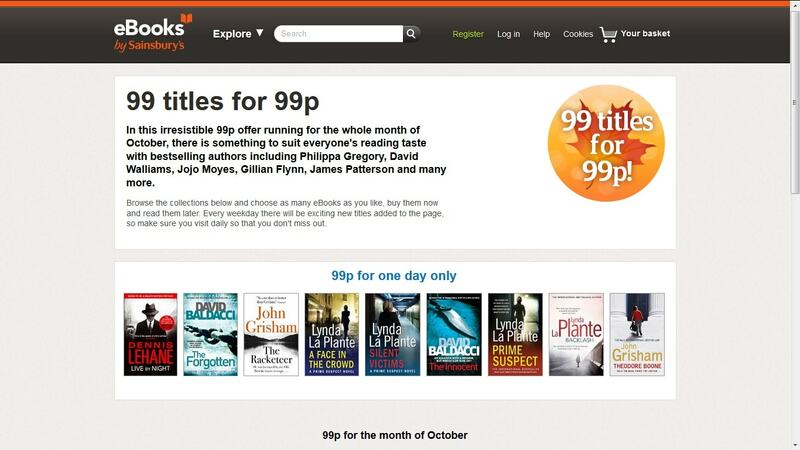 They've just launched a 99p ebook sale. It's not quite as ambitious as the book price war that Overstock launched here in the US a couple months ago but it should still draw in prospective customers. Over 100 popular titles in a variety of genres are included in the sale, which will go on until the end of the month. It will consist of a mix of 1-day specials and month-long offers. Some titles, including The Racketeer and several other ebooks by John Grisham, will only be offered as a 1-day sale. Based on today's offering (12 mystery and suspense titles) I think Sainsbury's might be planning to focus on particular genres for each of the one day sales. Sainsbury's bought Anobii in June 2012 but it wasn't until Jan 2013 that they renamed Anobii's ebookstore to eBooks by Sainsbury's. The acquisition and rebranding was a smart move on their part because it offers Sainsbury's a shot at earning a better return on ebook sales than WHSmith or Waterstones, 2 UK bookstore chains that partnered with Kobo and Kindle, respectively. Those chains are earning an affiliate commission, while Sainsbury's has the potential to earn up to 30% or more of an ebook's sale price. Along with Tesco, this is one of the ebookstores to watch in the UK market, IMO. Shutdown of the US Govt Could Delay the Release of the new iPad, Kindle Fire HDX? A small but significant observation for you regarding the eBooks By Sainsbury’s web site. They’re the first one I’ve come across that allow you sort a collection of books such as the October promotion by, wait for it … author. It seems kinda obvious that, as a customer, I might want to do that, but I can’t do that at Amazon, Kobo or Nook. At least not at their UK sites. Unless one of them has introduced that functionality in the past week or two. Nate, good call on this one. While Sainsbury is taking advantage of Tesco’s sluggish progress with Blinkbox, I think what we’re seeing here is far more significant than this. What we’re seeing is the opening shots in the bigger battle for Amazon’s UK crown. The 99p one-day specials are an exciting new development that should be seen as guerrilla tactics by Sainsbury that are giving them a clear edge over Amazon. By the time the Zon engines pick up the data and price–matched the deal has moved on. Sainsbury’s ebook store has some great features (as per comment above – but there are many more) and we can expect the Tesco Blinkbox store to be equally innovative. No official word yet whether Sainsbury will be bringing out a branded ereader or tablet, but I’d be very surprised if they did not. A small addendum to your WH Smith and Waterstone’s comparison. The two stores work on very dissimilar bases. WH Smith is a Kobo partner store, with the ebook store integrated into the WH Smith site (which incidentally has been revamped this summer and is quite sleek now!). A query on Tesco. You mention Sainsbury’s Anobii. Do you have any indications yet where Blinkbox will be sourcing? The old Tesco ebooks store (possibly the most dire ebook store every created) was fed by Gardners, but presumably they have gone direct to publishers this time for at least part of their supply chain. The Waterstone’s partnership with Amazon is quite different. Waterstone’s sells Kindles (instead of those tacky iRiver devices it started out with a few years ago) and gets a commission on ebook sales made on those devices, but the Waterstone’s ebook store is quite independent of Amazon, selling epub ebooks, and is supplied by OverDrive. Waterstone’s market share may be small, but overall sales should build steadily as mainstream print readers turn to digital and remain loyal to the branded. If Waterstone’s customers are happy to pay in-store prices rather than buy print from Amazon then they will remain with Waterstone’s as they make the transition. For Amazon, the Waterstone’s arrangement is the nearest they have come so far to a bricks and mortar partnership deal, and there seems little in it for them. I’ve always suspected the Waterstone’s deal was little more than a spoiler to stop the much-talked-about partnership with B&N. Sorry – that query on Tesco supply should have been at the end! Blinkbox is reportedly signing publishers directly. I think I mentioned this the last time I wrote about Tesco. I don’t think Waterstones is going to sell all that many ebooks on their own. They’re pimping the Kindle in-store and on their website, and that is sending too many customers to Amazon. Also, the whole “the ebooks we sell won’t work on the ereaders we sell” is self-defeating in the long run, IMO. I’ve been in the UK this past week looking in numerous Waterstone’s stores and the Kindle is invariably being sold from a tiny display most people would walk past without a second thought. There is no Kindle/ Amazon branding and no video screen shouting out the joys of e-reading to the uninitiated. Sadly no sign of any promo for the Waterstone’s own-brand ebook store either. By comparison Kobo in the W H Smith stores is getting real space and real promotion. It’s very clear the challenge to Amazon in the UK is going to come from the supermarkets. Sainsbury leads the way right now, but with Blinkbox Books imminent things are going to liven up. As per your link below, Sainsbury are already taking advantage of their position with the exclusive ebooks, and safe to assume we will see plenty more from both Sainsbury and Tesco as we hit 2014, and especially once Sainsbury gets its own-brand tablet on the shelves. The two UK supermarkets are going to blaze a path for other bricks-and-clicks retailers to follow. Smaller outfits that have to go through the ebook wholesalers catalogues will have minimal impact, but those that have the financial muscle to deal with the publishers direct – think Walmart, Costco, Target – will be able to do fancy deals like the Sainsbury cookery books exclusives while offering deep discounts or even loss leaders on big name titles. The days of Amazon’s dominance are numbered, but as the ebook pie will just get bigger and bigger everyone will be a winner. For now.